Inspired by the lovely, textural ice patterns found on a winter pond and knit in a bulky weight yarn, Frostbitten will keep you cozy and in style this winter, whether you’re chasing vampires or simply chasing away the cold! One size. Beret fits an adult head size of approximately 21” – 23” (53 cm – 58 cm). Using larger-sized needles, 14 stitches/18 rounds to 4” x 4” (10 cm x 10 cm) in stockinette stitch, unblocked. 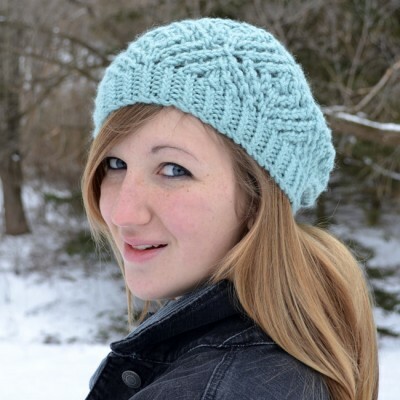 The Frostbitten Beret is knit in the round from the bottom up. 100 – 105 yards (91 – 96 m) of bulky weight yarn.